It’s sad to see the “deputies” applauding every stupidity that originates in the puppet theater, and how many respectable, and some admired figures — very few are left — are unaware that history will remember them as accomplices to the Totalitarian Government. Not to be forgotten is the consistent attitude maintained by the painter Pedro Pablo Oliva, who was expelled because of his personal opinions from the “Assembly,” where the people had put him, where one is supposed to repeat the institutional unlikely tongue twister they present as “democratic socialism.” In reprisal they seized and closed his Home Workshop, a response of the dictatorship so that those “parliamentarians” won’t forget that here there is no democracy, only absolute obedience to the whims of the Castro brothers. The truth is that at the last meeting of the “delegated representatives of the people”, the artist Kcho, (or perhaps his intentions were to venture into the humor and therefore I didn’t understood what he said), asked something stupid that I won’t venture to repeat again, and until that time he had been acceptable, because everyone’s opinion has worth, that is the teaching that they themselves have not learned. The sad, dramatic, the unacceptable, is what the other “lawmakers” will give a standing ovation to, rising to their feet, as a way of shouting to the world “we are stupid and all of us are incapable of having individual opinions,” because you can’t conceive that there are so many cowards together, that no one has the courage to confront the slanders they perpetrate there behind the backs and against the people, forgetting that their names will be part of the disrepute and history will not forgive them. The meetings of the “National Assembly of Cuba”, have become a place of sleep and overall apathy. We can see this simply observing what happens when the television cameras pan over those stale faces, struggling not to make their lethargy obvious, faces awakened only by the applause of some “parliamentary pilots” whose job is to warn them when they should be clapping or raising their hands in the unanimous vote that so shames us, and which is the living proof of the lack of individual thought in those instances. Apparently we will have to continue to live with such “councilors”, only Fidel, Raul Castro and God, know why and what they are there for, but what most Cubans do know is that they are never going to benefit the people they claim to represent. I read this phrase that I chose as a title on Facebook, and in the background were photos of Fidel and Raul Castro, the brothers who have tyrannically ruled Cuba for more than fifty years. It’s true, those Dictators rule because we Cubans on the island obey, because to confront them is to fear losing your life; we know that we are waiting for hordes of mercenaries with machine guns and tanks that will mercilessly drive over our bodies. What is also true and also sad is that those who publicized it were other Cubans whose only rebellion was to abandon the national territory. It’s as if they have forgotten their sufferings and their fears, as if they don’t remember their past. It seems unjust to me that those who saved their lives by putting geographical distance between them and this island, now push us to make decisions that could end in our deaths or in long prison terms, as Cubans know well what awaits those who dare to challenge the Castro brothers. It is dishonest that after putting the sea between them, they now demand attitudes that they themselves were not willing to take. On other occasions I have said that, for the most part those who have emigrated, whom I unconditionally support for having taken this decision, complied until the last possible moment and in a disciplined way with all the laws and requirements of the regime. 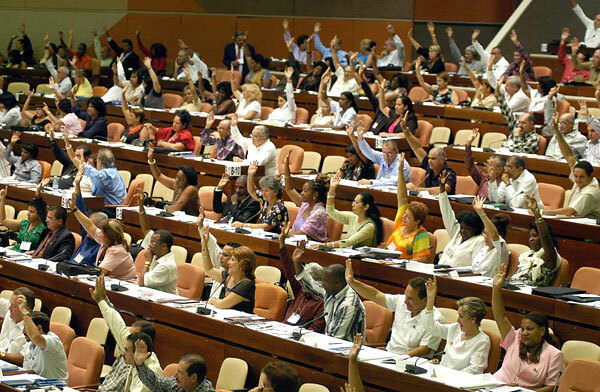 Most did not renounce their membership in the Committees for the Defense of the Revolutions (CDR), nor the Cuban Workers Union (CTC), nor the Territorial Militia (MTT); intelligently they remained mute so as not to attract the attention of the authorities and so they were granted the “White Card” — the permission to leave the country — an action I don’t criticize, nor would it go well for anyone who did otherwise. 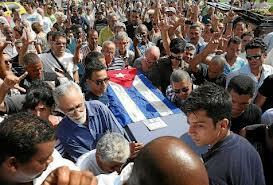 But for these same reasons it does not appear just or humane that they now ask for self-immolations from those who, like them, at least desire and need to survive the totalitarian system that rules the Cuban archipelago. As it is also true that if all of us had remained here, the country would have exploded in a popular revolt like a pressure cooker, from the pressure of the terror, freeing ourselves from these dictators whom we have suffered for such a long time. Some would repeat the popular phrase: it’s easy to push without hitting. To reach such conclusions is offensive, because to humiliate those on either shore is useful only to our enemies. Better they should suffer for their compatriots left inside here, and try to care for them, because in the end most of the dead and the prisoners are those of us who stayed from the conviction that we must find, together, the road that leads us to the democracy that Jose Marti dreamed of in the century before last, and that we still have to conquer. I always say that those inside the island and the outside create the perfect scream. Without them — without you — we would be only half, our pain would find no echo, nor, therefore, any receptors. Our pain comes from the mouths of those who are in the lands of freedom, those who are not persecuted by censorship, and those who have no henchmen waiting at the doors of their homes to silence them with blows. And so, both sides, the exile and those of us who inhabit this island of ghosts, we need strength, we are the perfect chemistry to oust the tyrants of this place that belongs to everyone equally. In his particular case it should be understood that — during the years he was at school, which he quit at an early age — Kcho attended the Gerona School for Special Education, which provided schooling for children with learning difficulties. You might recall the documentary on his work in which subtitles had to be used so that what the artist said could be understood. Thanks to the work of speech therapists, we can now at least understand what he is trying to say. How is it possible that an artist can ask his compatriots and colleagues to work for a system that exploits them. Of course, it is understandable given the way he explains it. Whenever the Marta Machado Artistic Brigade — named after his late mother, whose greatest achievement was giving birth to him, developing his innate talent and setting him on his way — calls a meeting to “help” the people, it serves as nothing more than as a means of self-promotion and a way to loot municipal and provincial coffers, whose funds he coldly and larcenously extracts. A few years ago I was invited by the National Union of Cuban Artists and Writers (UNEAC) to visit a camp set up by Mr. Kcho in Candelaria, Pinar del Rio province to provide “artistic” aid to residents who were victims of a hurricane that had left them homeless, impoverished and virtually without food. After visiting the site and listening to accounts from the camp’s neighbors, I learned that what was actually ravaging the place was the presence of voracious brigade members, who, in spite of the shortages being suffered by the population, were demanding fresh salads, fruits, desserts, wines and other refrigerated luxuries. The most appalling thing to me was that these expenses were paid not from the artist’s own funds, but rather by the state, specifically on the orders of Fidel Castro. All the televised propaganda that reported on this project served no purpose other than to give a politically false impression. But the greatest horror experienced there was that the most scandalous orgies were organized under the camp tents. Kcho and the painters who made up his retinue chose girls they found beautiful to serve as companions. They were selected from art schools or taken from their homes with promises to rescue them from the deprivation and hunger they were enduring. This was done with the consent of their parents, and the support of the school and regional officials, who introduced the girls as a way to satisfy the sexual pathologies of Kcho and his cohorts. Those who went in as young ladies were something quite different when they came out. Many turned to uterine scraping in an effort to undo their pregnancies. Of course, pigs roasting on a spit were a daily occurrence, at least on the days Kcho chose to be present, since he only occasionally made the sacrifice of sleeping under a tent. He justified his trips to Havana with the excuse that he had to go look for provisions, allowing him to flee the toil and misery left behind by the natural disaster, and to sleep peacefully in the air-conditioned house at “El Laguito,” given to him by his “comandante,” Fidel Castro. It was worse at Isla de la Juventud (Island of Youth), where he plundered the culture budget to such an extent that there was no money left to pay artists. Year’s end was drawing near and they had not been paid for two months. Might this be what he means when Kcho talks about working for free — a way for him to enjoy luxuries and binges with his friends? With money from the culture ministry he bought televisions and refrigerators, which later, after his stint with the brigade appeared to have ended, were given to family members. The residents observed how his uncles and cousins came looking for these appliances. Is this not theft? And none of it was hidden. So ignorant is he that the did it openly in front of people who, in general, prefer to remain silent to avoid losing their jobs, which are their families’ the only source of income. His depredation became so great that many of the island’s artists considered going on strike if they were not paid by the end of the year. To get the matter resolved, someone had to call “Ministry of Culture,” which issued a bank transfer to help the artists and calm heated emotions. That same official, a fan of dominoes, once invited Kcho to play a game, and to this he responded no, because he couldn’t bear to lose. Of what free work, then, would he be talking if he doesn’t know how to lose. Of course, it’s not about him, he gets thousands of dollars for his work, for which we congratulate him, not for asking his compatriots to be slaves which goes against the essence of an artist. It’s absolutely certain that Kcho didn’t read Marti, because he doesn’t know that the Master wrote that Socialism is the highest stage of slavery. In one of my published books, The Children Nobody Wanted, in fact, the designer chose a photo of an installation that Kcho made with several rafts and inner tubes, precisely because it expressed the pain of Cuban youth who feel forced to emigrate, and in which he was able to consummate the dreams of several generations who through their luck on the sea in hopes of a better future, and of the other great part of the same youth who never get there, so their lives and dreams are truncated, works whose titles speak for themselves: The Road to Nostalgia, The Infinite Column, In Order to Forget, In The Sea Nothing is Written, The Jungle, The Sons of William Tell, Delaying the Inevitable. Until Kcho was lifted up by power, his work was a reflection of his generation, since then it has become many things, but sincerely and without rancor, we must recognize that his talent has evaporated, and that for several years it’s been a repeat of the same: the pot and the palm. Indeed, back in Gerona, his birthplace, friends, neighbors and acquaintances were always ready for this mania many painters have for drawing on any available piece of paper, and sometimes on napkins Kcho would make some sketch for what would later be a painting. So he gave his friends these sketches warning them they couldn’t sell them. Some, when they were financially pressed, managed to get a few bills from tourists, and when Kcho learned of it he lashed out against them and ended the friendship. In his little understanding it was as if he didn’t comprehend the neediness of those around him, nor that with their sale they managed to subsist in the daily misery, and that the best measure of a friend is when he can, with his art, provide food and comfort to those with whom he shares a friendship. Summing up the case, in addition to knowing that the human being Alexis Leyva isn’t one of the great lights, the money he raises for his work, for which we applaud him, and the benefits he extracts from the government, which we criticize, and what he has achieved through his disjointed and unintelligible fanatic adoration of Fidel Castro, has made him the favorite son of the dictatorship, and has led to a level of disconnect with the Cuban reality, such that like a robot he only expresses fatal words, lapses before the history that will recall him and the opportunist he is. Like many artists he’s only interested in living in the moment, and it is not his fault that he lacks the capacity to assimilate a little bit of the knowledge of history, and not knowing the future, when all the horrors he committed in defending Fidel Castro and his followers are exposed before his eyes, then we will hear that he didn’t know, that he could never have imagined, and, like now, we will have to simply look with pity on his bulk that gets fatter every day at the tables of the Palace, the Council of State. That is his pay: the giant shrimp, huge lobsters, and the arm of the dictator around his shoulders as he poses. The sad news has come to me that Ibrahim Doblado died. And after recalling our jokes, complicity and sympathy, I felt relief for him. Unfortunately for many years he was abandoned. For the government, of course, it will just be one less writer, which is the same thing as: one less enemy. He was one of the last friends I had,and also one of the last that I lost. But earlier he had been very grateful for my friendship. Whenever he came to Havana he came to my house, there he printed his most recent texts, and also sent mail to his friends scattered around the world, who promised him some publication. He suffered from diseases of the nerves and other maladies that his ancient body resented. Once I had the chance to visit his beloved island of Turiguanó where he lived, as I’d promised him, and I traveled over 400 miles to see him. When we saw each other he couldn’t believe it and just hugged me and laughed happily. I spent several hours in his apartment and toured the town. He had one constant paranoia: State Security searched his apartment. He left marks on the door to know when they entered, this he told me. Then, when I opened the blog and started to be a public enemy of the regime, I dedicated a post to him, I wanted to defend him, to demand the attention he deserved. 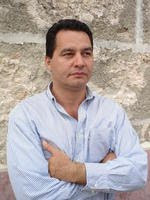 This was when the Cuban Book Institute, with the Taliban Iroel Sánchez at the helm, was giving out computers all over the island to supposed writers, mediocre and opportunistic, who only had one path to being called artists which was to play the game of the system, of course, pure mercenaries without works, who earned points for their “defenses” of the Revolution, and the functionaries provided them equipment and Internet access so they could come out against any criticism of the dictatorship. Then I pointed out that they should give one of those computers to Ibrahim Doblado, a true artist, with acknowledged work, who had to beg the Custodian of the Youth Club at night to let him go to the computer room and digitize his texts. Days later Ibrahim came to the house, as usual, very frightened, clearly afraid, and let me know that an Argentinian writer living in our country had shown him my printed post, and he said I was no longer his friend because I was looking for trouble with the authorities. That I was a counterrevolutionary and that he shouldn’t visit me any more to avoid complications. I guess he listened in silence, without being able to avoid the fear that they injected in all the artists of his generation. Later we met on occasion, and he didn’t talk about, nor did I feel it lessened his affection for me. Later life changed and I had to abandon my house to flee from the arrests and acts of repudiation, I turned into a nomad, and Ibrahim and I lost touch. I didn’t even know he was living permanently in Havana. The news of his death reached me almost a month after it happened, through a friend whom supposed, from my silence, that I was unaware of the fact. Now I read that the commissars of culture are planing a colloquium on his work and I don’t know what other tribute. Their hypocrisy of remaining silent before the suffering of Ibrahim and now link his name to the dictatorship. They think the dead can no longer harm the system. They did the same thing with the writer Guillermo Vidal, and others as well. These days I should write the post about Virgilio Piñera, another great misunderstood writer that the regime was responsible for doing great harm to in life with a particular vengeance. 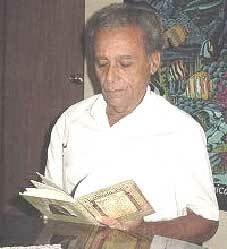 Now, Ibrahim, you are with your God and those writers who both admired and read you. Rest in peace, as you deserve, after suffering much misfortune in these — in spite of everything — beloved islands of yours. 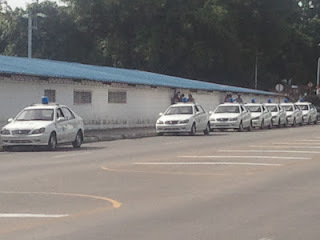 Detention of Antonio Rodiles: Guilty of the Free "Estado de Sats"
When the funeral cortege left the chapel in Cerro with the body of the political leader Oswaldo Payá, having barely advanced a few yards, it was stopped for some twenty minutes. Something happened at the beginning of the caravan. Several people got out of the car to find out what; we feared the worse although we hoped that nothing was happening and we wanted to give a Christian burial to our dead. While celebrating the Mass officiated by Cardinal Jaime Ortega, outside, the authorities were planning the engagement. 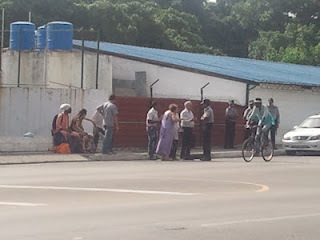 I looked out of the door of the church, looked down the street and I could recognize the faces of the State Security agents, but there, at the end, where the Calzada del Cerro terminates, I saw an officer talking to a large group of civilians. I remembered that it seemed very much like the operation they had every time the Ladies in White met at their headquarters: the house of their spiritual leaders, the feisty Laura Pollán. I recorded some footage of what was happening and approached as far as the camera lens would let me. In any event, I couldn’t imagine they planned something similar in the midst of that pain, that they would disrespect the family of the deceased, the Cardinal and the entire delegation of the Catholic Church, as well as the broadcasters and the international journalists covering the event. But despite the constant proofs of the governmental abuse, we still insist on being naive, as if this attitude would save us from contagion by the all the evil that always surrounds us. What I do know is that the partner of Antonio Rodiles, Ailer Gonzalez, with the intention of finding out what was going on, got out of the car, and, coming to the crowd, witnessed how they preyed on Fariñas and another group of opponents. She demanded their release and the police pushed her also, and forced her with beatings onto a Chinese-made Yutong bus that they’d prepared by way of a rolling jail cell. And inside there, they continued beating her. Antonio, impatient on seeing that his partner didn’t return, went to look for her. While he was walking he heard a State Security Agent shout to another who was nearby, “Look, there goes Aleaga, let’s grab him.”Rodiles observed that Aleaga wasn’t even taking photos, just walking on the sidewalk, and he said to the “securities” to leave him alone. They looked at him and responded, “Come on, you too, you’re going.” He refuses, meanwhile seeing that Aleaga is being put in a car handcuffed. Rodiles resists their putting him into a car, finally they lay him on the backseat and two burly agents climb on top of him to immobilize him with the weight of their bodies. The lawyer Vallín is in the car with me, and deducing that something happened at the beginning, we get out, and when we’re about to go to the place the procession resumed its march and we got back in the car. In the Calzado de Cerro they’ve already armed an operation of the repressive forces, we managed to see a woman with the rank of colonel waving for the caravan to continue. They had two Yutong buses on each direction of the street that were blocking traffic. Without distinguishing the faces I could also see that there were several people inside the buses that they were hitting. Later I learned that they were Fariñas, whom they hit at that moment, which he returned with the same energy. Ailer was in that bus; and she said the struggle was maintained for a while, that the driver took the route toward the beaches to the east of Havana. That there was a moment when they thought the bus would turn over, it looked like a swing and gave the impression that the driver lost his way, that they would be killed and she began to plead with Fariñas to stop, because he was continuing to brawl with the agents who were trying to hit him. Fariñas looked at her and understood her fear and appeased them to please her and calm them down. It was a humane act and one of chivalry that made the difference with the government’s henchmen, who continues their insults and provocations. They take her to a place that looked like a shelter or abandoned classroom, and told her to hand over the memory card of the camera. She had already secured it, taking it out of the camera and putting it in her purse. And she refuses to surrender it, warning that they themselves are violating the laws, she has been kidnapped on a public street, and they are violating her civil rights that she knows well. But two women and a man come and push her and throw her on the floor to demobilize her and take the bag. She yells at them one day have to answer for their abuses and repressive attitudes that tarnish the name of all their families. She warns them that she has heart problems and has arrhythmia. They show their fear. Soon they take her to the outside of the Naval military hospital and tell her to exit the car. And leave her there abandoned. When they take Rodiles to the police station, Aleaga has just arrived. The “securities” continue provoking, they want him to enter a cell but they can’t make him do it despite the shoving, they have given him a lot of punches, scrapes and torn his clothes. I’m not a criminal, Rodiles tells them, I haven’t committed any crime and I am not going in any cell. A lieutenant colonel in the police intervenes and tells the “securities” that they will allow him to talk, look, he said, I give you my word I will not let them take you to the cell, but first you have to give me your shoelaces and belt, it is mandatory; they put in the waiting room. And what about Aleaga, asks Rodiles. The officer keeps looking at him and understands it will have to be that way or he will continue his protests. Fine, he stays with you at him and know that you will have to be so or continue their protest. Okay, it stays with you, he responds. The “securities,” against their will, accept keeping them out of the cell. We arrived at the cemetery worried, we didn’t understand clearly what had happened. Someone said they had arrested Rodiles, Aleaga, Ailer, Fariñas, among many other dissidents. Singing, accompanied the remains of Oswaldo Payá, from the entrance to the chapel, then to his grave. That death had changed us, the living. 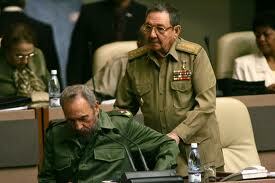 Taught us, once again, the lack of scruples of the Cuban government. 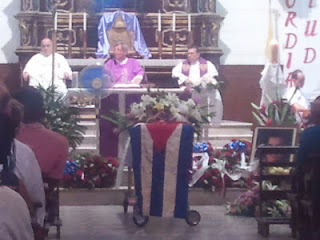 Nevertheless, we agree that Payá received the funeral honors worthy of a President. That last space I toured hugging the great Cuban poet Rafael Alcides, who, recovering from a recent hospitalization for his diabetes, had not wanted to fail to pay his respects and say a final goodbye to the brother in the struggle. He told me that of course all of us who are fighters like Payá are aware of the risk that faces us when we defy a totalitarian government. But we know that despite risking our lives, it’s impossible to avoid our protest. We were told that Aleaga and Antonio remained in detention at the 4th Police Station in Infanta. In half an hour we were there, along with a group of young fighters, Yoani Sanchez, Reinaldo Escobar and Santana (the writer), to accompany the families of those arrested who were waiting outside the station. There I found a lawyer Vallín who went inside, from time to time, to demand that at least they present the arrest warrants, which they had not yet done; he warned that they were detained there as hostages, in open violation of applicable laws. Soon a Major of the police came to ask Vallín speak with us and to tell us to go home. By that time we were over twenty people. Vallin told us the desire of the officer after he had retired. We were laughing that the officer thought, just ask, we would retreat. At the time the Major came out again and warned us that we could not be there (we stayed right across the street from the police station). He said that in twenty minutes they would release those arrested. So we decided to go to the facing sidewalk. The Major returned and told us we could not be there either. To facilitate the release of Antonio, we decided to retreat about fifty feet, our position was no longer right in front of the station. But those twenty minutes passed when they promised to release him; and we waited an hour. Then it occurred to someone to make “a small geographical pressure,” and we returned to the place where we were earlier, on the sidewalk right across from the station. From there we could observe every movement. The Major returned and told us he was the Chief of the Municipality, and that it we continued there he would have to send the “forces of order” to remove us. We were already over thirty people demanding the release of our brothers. The writer Orlando Luis Pardo had come, with his girlfriend and another girl. We told the official they we felt for him for all that he’d gone through, given that he had been patient and at all times, had turned to us with respect, but we urged him to keep his word. Reinaldo Escobar told him to put himself in our position, would he be able to abandon a comrade in these circumstances, and we didn’t even know under what condition Antonio was in, if he was beaten. The officer tried to deny our suspicions, saying they didn’t hit him, but when we showed the wounds that had some had recently received from the repressive forces, among the other detainees Ailer, who had just joined us, the soldier chose to remain silent and, nevertheless, seemed to understand, or maybe it was our decency and sympathetic stance. Finally we told him that if he felt that he should pressure us, we were determined to accompany Antonio in the cell. They we had no objection to his doing his duty. Then he left and never came back. After a while they released Aleaga and we applauded as he walked out in front of all their captors. But if they thought we would settle for one of two taken, they were wrong; they were left waiting to see what we would do and when they saw we would continue stationed there, they formed the idea to devise other action against us. Half an hour later a truck of the Special Branch appeared, full of guards. Also two ambulances arrived. In one corner State Security agents in plain clothes began to meet. Ailer saw one of the ones who had beaten her and took advantage of it to tell her abusers to their faces that one day they would have to pay for such abuses. The men did not answer. They turned away and we saw them climb the stairs to shelter in the police station. Someone phoned to say that Fariñas had been taken to his province in a police car. Soon we were approached by a “security”: a black guy six feet tall who, in order to provoke us, stationed himself very close to us. But his presumed bravery was just a show for his comrades who were watching, because Reinaldo Escobar also went to meet him, and when he passed behind him, I saw the “security’s” cowardly eyes, his six-foot body shrank, he turned to follow Reinaldo with his eyes as if he was afraid of being attacked, something Reinaldo would never do, quite the contrary, because what he did was fake a call for him to overhear, as if he were telling someone that everything was fine. After that the provocateur also pulled out his phone and informed us we were clowns. I took mine and he heard me and I said there were no problems, that the provocation was sheer monkey business. Then the black guy quickly left, frustrated at not having received the order to beat us and take us by force, which is what he wanted. After one o’clock in the morning, Vallín and Reinaldo spoke to the Colonel, who said he was the Head of the Station. Vallín said he had twenty-four hours to make the decision to charge the person or not, and to define the offense for which he’d be tried. The official acknowledged that was true, by law, and confirmed that ten o’clock marked the term, and then he would report back what they would do in that case, which they were now studying the decision to make. Vallín and Reinaldo made it clear that it was an agreement, and the Colonel agreed. The elderly parents of Antonio said as long as we were there they would not leave. Then we got them to agree to let us take them home and come back and meet at ten o’clock. The couple agreed. And so we all went. When I reached the police station with the attorney Vallín, already there were Antonio’s parents, his partner and some other opponents. Forced to sit in the sun on the sidewalk in front of the station, they would not let us approach, in fact no pedestrians could pass through the place. The whole street was blocked by police cars and policemen. We had to wait twenty yards from the station. When Yoani and Reinaldo arrived, they hurried their steps to join Antonio’s parents, and police tried to stop them, but they, like experienced athletes of the opposition, managed to dodge them and sit on the wall where the elderly parents were. A police captain said they could not stay there, and Yoani and Reinaldo told them about laws and rights and the police were astonished. All they could do was exert force, but their order was to avoid confrontation at all times. They were very close to the fateful date of celebration for the defeat of the 26th of July, and they didn’t want to tarnish it, it was bad enough with the mysterious death of Oswaldo Payá. Immediately the Colonel came out, it was 10:10 in the morning and he should comply with the agreement. He spoke with the parents and then with Vallín, the decision was he would be released, and then we saw Antonio could out in a patrol car and greet us. The Colonel said that the prisoner would be brought to his house. When we got to Antonio’s house he already was there and told us the abuses they committed, all the horror that his oppressors made him suffer to force him to give up; we saw his ripped clothes ragged, the bruises and scratches on his body. We all returned to our homes knowing that Antonio, Ailer, Aleaga, Fariñas and the rest of the group were already in theirs, wanting rest, until a new warning alerts us that another injustice has been committed, and we have to once again be present for the freedom of Cuba and our brothers. Those hours helped us to push the wall of the dictatorship that oppresses us a few inches. We know that the worst part of this difficult struggle is yet to come, that to achieve democracy we will make many sacrifices. But the good thing is that these days we confirm that, despite all the repression of the Castro regime, we worthy Cubans are ready to give ourselves for the ideals that Oswaldo Payá died for.